This factor relates to how an entire site is developed in relationship to neighboring uses, paying particular attention to building height and scale, orientation, and layout. The presence of these triggers in higher intensity LUTAs (UM, UH, DT, UC and TOD) may not indicate a compatibility concern because larger differences in scale and massing are expected and appropriate in these more urban areas. Projects that meet the criteria below must use mitigation measures to mitigate compatibility issues. Residential lot sizes in UL that are less than 60% of directly adjacent residential lots. Residential lot sizes in RM that are less than 40% of directly adjacent residential lots. Setback is significantly deeper or more shallow than predominant pattern of adjacent development. Building’s orientation to the street differs from predominant character of adjacent development. Buildings within 40ft of a single-family residential structure that exceed a 3:1 ratio in height from the top of the highest building to the base of the residential structure. Building size or street frontage dramatically differs from that of adjacent uses. Lot coverage (including buildings and paved areas) dramatically exceeds that of adjacent uses. List of potential measures to mitigate issues of compatibility. The list is not exhaustive. Developers are encouraged to propose their own solutions. Provide gradual transition between smaller and larger residential lots through the arrangement and scale of lots and/or by providing appropriately scaled buffers. Minimize the mass of buildings that directly face smaller, pre-existing buildings by: 1) reducing the visual impact with larger setbacks than those prevailing on the street; 2) incorporating design and elevation features that complement adjacent lower-density development; 3) stepping buildings down to a scale (building bulk, footprint size, and height) complementing adjacent development; and/or 4) breaking up massing of buildings. Design structures in a manner that provides a visual or height transition and complements the scale and form of adjacent development. This can be done through reducing building height, providing step-backs, varying massing, increasing set-backs, and other techniques. Alternating/undulating facades, especially for buildings longer than a standard block. Adjust yards, landscaping, and building setbacks to reflect patterns in adjacent, lower-intensity residential areas. Use drainageways and swales, mature trees, wetlands, prairies, and grassland areas to improve compatibility in building scale. Locate, design, and manage stormwater management features (including retention and detention basins, swales, surface drainageways, constructed wetlands, and greenways) to provide visual amenities or entryways, or to provide opportunities for passive recreation. Provide most parking in the interior of multifamily residential projects rather than between buildings and the street, using residential buildings to define the street edge. Use landscape, pedestrian ways, bioswales, and parking design to divide large parking lots into smaller blocks. Use landscaped buffers and screening to reduce the visual impact of parking facilities on adjacent residential areas. Place parking lots between taller commercial buildings and single family homes. These potential conflicts are caused by operational characteristics such as noise, light, hours of operation, emissions, and odors. Typically operational impact concerns arise when a project is proposed next to a less intense use. However, in some cases the proposed project may need to take measures to reduce the impact of an existing use, such as a residential use proposed next to an existing industrial use. Projects that meet the criteria below must use mitigation measures to address compatibility problems. Hours of operation before 6 am or after 10 pm of businesses within proximity to residential uses. Contain operating effects (including noise and odors) within building walls to the maximum degree possible and at least within site boundaries. Use vertical screening to block visual effects of high-impact components such as mechanical equipment and service areas. Direct light generated by higher intensity uses, including direct illumination of parking and service areas, signs, and structures, away from adjacent residential areas and public streets. Screen drive-through services and integrate screening into the overall design of buildings and landscaping. Contain the visual impact of these service functions from adjacent public streets and neighboring residential properties. Reduce noise through additional wall insulation, plantings, fences and walls, and strategic placement of doors and windows. In auto-oriented settings, the amount, timing, and routing of traffic generated by the use can produce impacts on the surrounding area. This measure focuses on the differences in the amount of traffic generated between a proposed project and existing uses. Issues of traffic compatibility may be less of a concern in UC, TOD, UH and DT LUTAs. Inconsistent with the Roadway Compatibility Chart below. 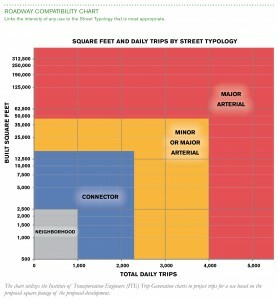 Average daily traffic substantially exceeds that of existing, adjacent uses. Coordinate with the City to construct improvements necessary to mitigate the project’s impact on the subject street or intersection. Enter into a development agreement with the City to jointly upgrade intersections or networks over time. Utilize site designs, building groupings, and site features that accommodate and encourage the use of transportation alternatives, including pedestrian, bicycle, and public transportation. Examples of techniques include continuous walkways from public sidewalks, transit stops, and multi-use paths and trails to building entrances; use of durable surface materials to define pedestrian routes and crossings; and visible and convenient bicycle parking facilities. Increase the connectivity of the street network to reduce reliance on single routes for access. Design connections to avoid channeling traffic generated by higher-intensity uses onto Neighborhood streets except as part of comprehensively planned, mixed-use projects. Provide means of access to residential areas that avoids requiring residents to use Arterial streets for short-distance trips. Connect buildings on the site with internal streets and drives, and pedestrian connections and pathways to prevent unnecessary local traffic in adjacent areas. Make maximum use of internal cross-easements and shared access points between or within individual projects. Use traffic calming techniques to reduce speeds between adjacent properties. The Roadway Compatibility Chart links the intensity of any activity to the road type that is most appropriate for that intensity. The intent is to fit developments and roads together by ensuring that the activity creating trips is located on a roadway designed to handle the impact. It also strives to make efficient use of public investment by not overcrowding or underutilizing roadways. A 2,500 square foot fast food restaurant with a drive through is expected to create 1,240 daily trips. This would mean the access to the site should be taken from a Connector or larger street. A 40,000 square foot supermarket is expected to create 5,100 daily trips. This would mean the access to the site should be taken from a Major Arterial. A 100,000 square foot warehouse is expected to create 350 daily trips. While the trips generated are not significant, the scale of the project would mean the access should be taken from an Arterial. For the base LUTAs, it would be acceptable to move up one classification to a street able to handle more intensity. In the case of the fast food restaurant, it could take access to a connector, or the next higher classification of a minor/major arterial. For the Urban Commercial, Regional District, and Employment Reserve Layers, it is expected that more intense uses can take access to lower classified roadways. A shopping center may fall in the traffic compatibility range of a minor/major arterial, but the best way for it to take access is directly from a neighborhood or connector street that intersects the arterial at a controlled intersection. This would be dependent on the center having good internal circulation and providing those access points in the half of the block nearest the arterial.